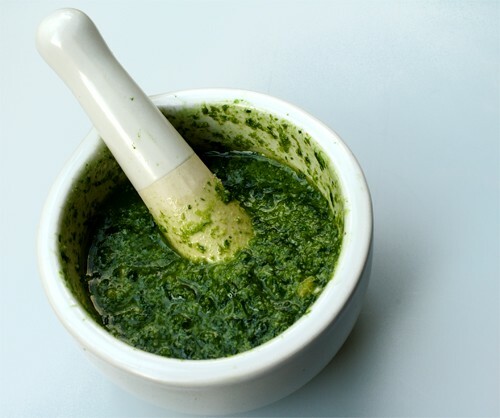 I love pesto. Whoever first thought of grinding up basil, nuts and olive oil into a delicious paste - I salute you. And enjoy the fruits of your genius on a regular basis. Or, or least I did, until I realized I was lactose intolerant. And almost every store-bought variety of pesto has parmesan cheese in it. Woe was me, until one day I was standing at the deli, forlornly scanning the list of ingredients on a tasty little pesto package, and I realized my mistake. Which was - pesto sauce only has about 5 ingredients in it. Why the hell was I buying it for $8 a package at Safeway anyway? There had to be some way I could make it at home, cheese-free. Later, deli. Oh haaay Google! Thanks for introducing me to nutritional yeast. Nutritional yeast (aka brewer's yeast) is magic. It gives you the creamy texture of cheese, without the cheese part. Plus it has B12, which is one of the only vitamins you can't get from a plant source. Throw all ingredients in a food processor and blend 'em up. Don't go crazy with the blending - it should still have texture. For a low fat version, replace some of the oil with water. Feel free to play around with the ingredients - throw some sun-dried tomatoes or roasted red peppers in there if you're so inclined. Makes enough for two giant servings of pasta. Enjoy! Or, you know, invite me over to eat it with you. I'll bring the beer.